HADLEY – The way Rob M. Laporte sees it, what use is having a Web site if no one can find it? His 5-year-old search engine optimization company, DISC, specializes in tweaking Web sites so they turn up more frequently in commonly used Internet search engines. Instead of focusing on snazzy layouts or elaborate animation, DISC applies a rigorous analysis of a company’s business and the terms used by customers looking for their type of products. The priority in its redesigns is usually to make a Web site emerge more frequently in the search-engine queries of potential customers. To do this, DISC analyzes the most frequent terms and words associated with the product and seeks to include them frequently in key areas of the Web site, both areas that are visible to users and those that are embedded in code. Automated programs that index the Web for major search engines give more weight to words used in some parts of a site than in other parts. For example, the highest weighting in a search goes to the title that appears at the top of the browser’s window. Without making it nonsensical, Laporte seeks to include key words in the title. Another key is the description submitted by a business to some human-edited search-engine companies to describe a site, Laporte said. Increasingly, the automated and human reviewers at search engines do not even look at much of a site, Laporte said. Complicated layouts can make it even less likely that the search engines will index a full page, Laporte said. Laporte is fairly blunt about the value he offers people for their Web sites. “My sites make money,” he said flatly. While optimization is accepted in the business, search engines frown on deliberate misdirection in sites. Some Web-site designers used to embed secret text in a site to lure search engines. The text would appear in the same color as the site’s background, meaning users could not see it, but automatic programs analyzing the computer code would read and index the words. “That will get you kicked out of a search engine today,” Laporte said. Other tricks include an entire page of text, containing terms intended to draw search-engines, that disappears in the blink of an eye. The user doesn’t even see the page, which is replaced almost instantly by the true Web site, but automated systems will read only the initial page. Laporte started the company in 1995 as the Document Imaging and Scanning Co. 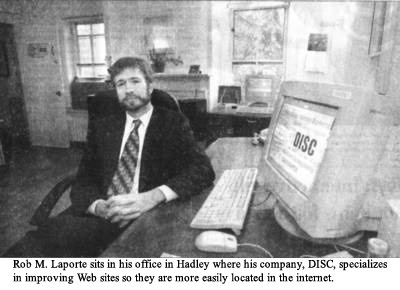 While he was a graduate student in English at the University of Massachusetts at Amherst, Laporte scanned documents into computers for use by lawyers and businesses. 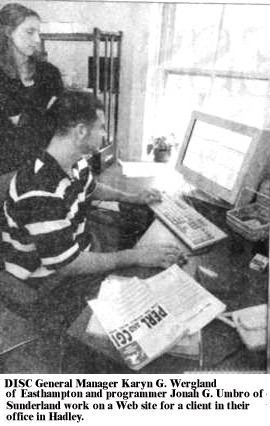 He became interested in the Internet at about that time and helped build the English department’s first Web page. Financed initially by running up his credit card debt, Laporte said the search engine optimization company now has 10 full- and part-time employees and revenues of more than $200,000 this year. Laporte said he expects that figure to grow next year. He has worked for Barnes & Noble, Hardigg Industries in Deerfield and other firms. DISC charges from $3500 for a site and up, although the average is around $12,000. Web design is getting more complicated as it increasingly moves into more complex areas such as integration with elaborate business-wide software systems, contact management and customer service programs. “It’s getting very tough to simply design a Web site,” Laporte said. Advertising and search-engine optimization are complementary, Laporte tells clients. There are, of course, other issues in designing a Web site. It must download quickly or people will lose patience, Laporte said. A site should be attractive and intuitive to navigate, as well. Good writers just naturally use words that will be pertinent to the user,” Laporte said.